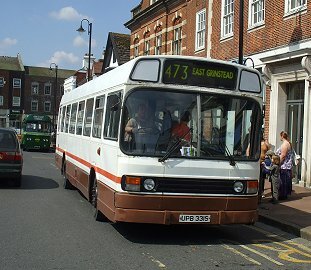 RF146 squeezed between RT3228 and GS2 to reach the War Memorial stop in East Grinstead, to load up for a trip on the 434 to Edenbridge and the Troy Town Loop. 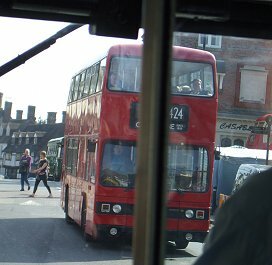 I managed to board, and found a seat near the front that gave me a view forwards. We set off towards the station, turning north down the hill. 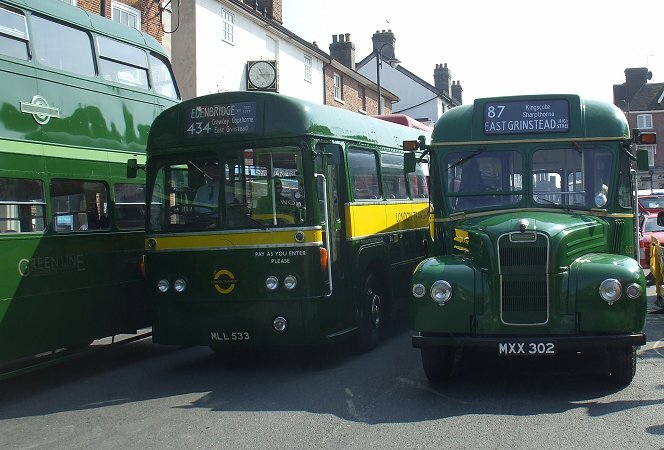 We met RM1397 scurrying into town wearing blinds for the 36B, then turned left for the station, passing RM1955 (wearing route 36 blinds) which had arrived with a group from Worthing and was parked up for the day..
We stopped at the Station bus stand, and paused for photos to be taken. 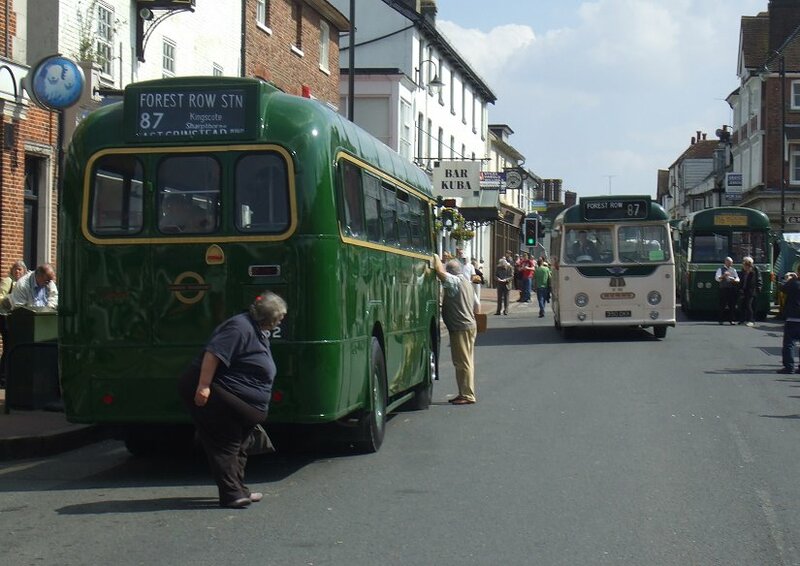 Then we were away again, on round the one-way system and back up into the town. 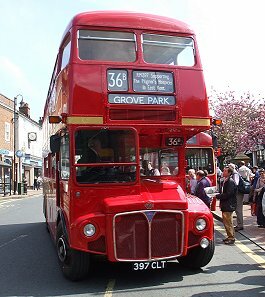 We passed preserved Metrobus Olympian 395 on its way to the station and Copthorne. At King Street we passed RT604 heading north with a 409 to Dormansland. 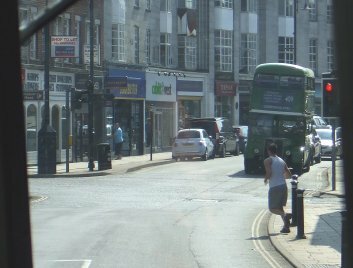 We climbed up over the speed-bumps to the High Street. 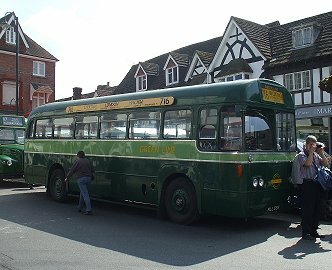 After a pause outside The Crown we continued, passing another Titan - T1101 - on its way westwards on a 424 to Copthorne. 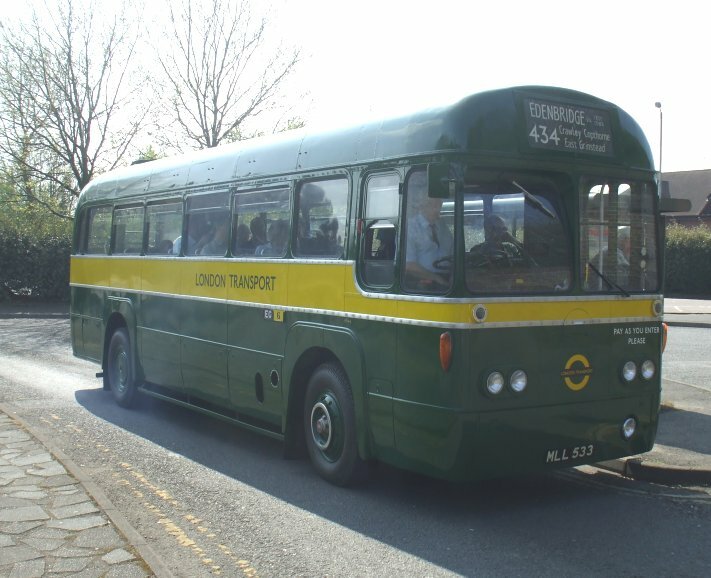 We turned north down College Lane, crossed above Beeching Way (the old railway cutting now the A22), and descended Blackwell Hollow. 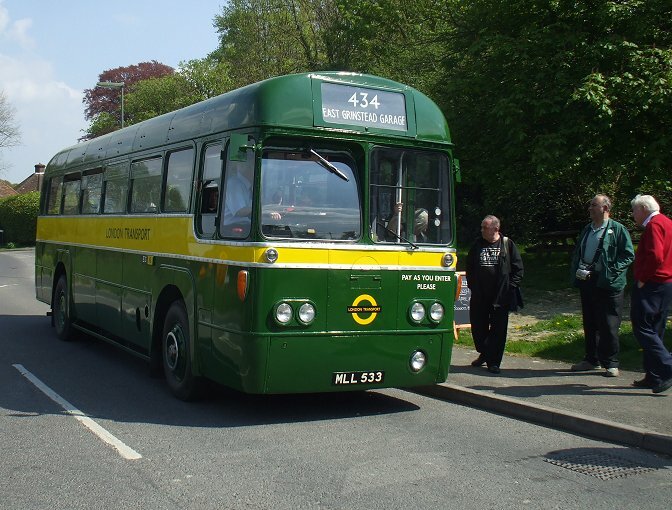 We followed the A264 up out of East Grinstead, past the Quarry Estate, and turned off on the lane to Dormansland. 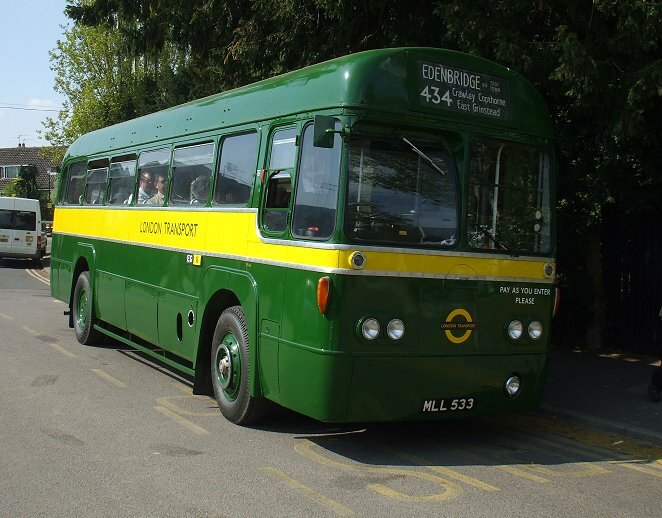 We passed the Plough and followed the B2028 eastwards into Kent. 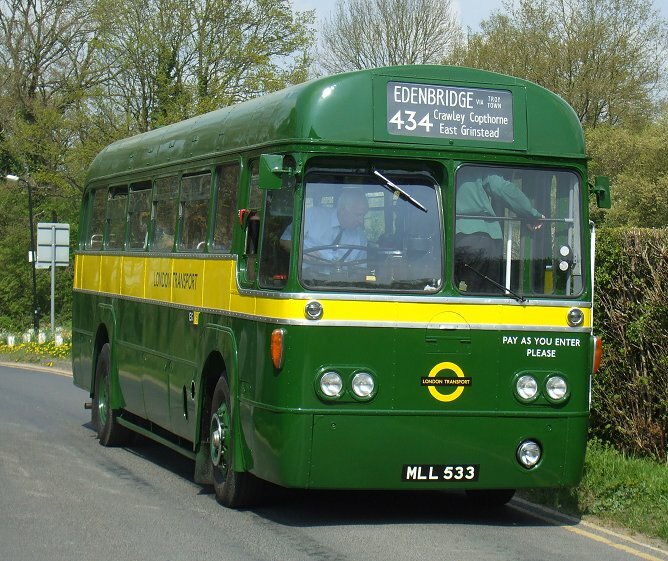 We carefully picked a way through Marsh Green and turned north on the B2026 into Edenbridge. 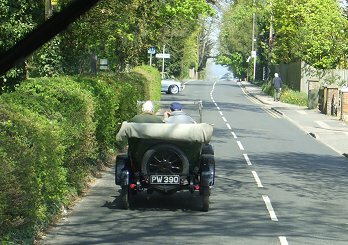 We were not the only elderly vehicle out today. 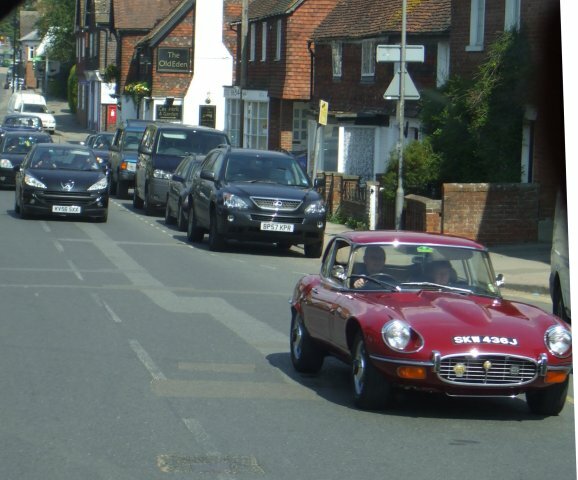 A stream of elderly Jaguars passed us in the opposite direction, and we followed PW390 into Edenbridge. Jaguar SKW436J headed the other way as we passed The Star. RF600 passed us on a return working of the 434 as we negotiated the narrow Edenbridge High Street. 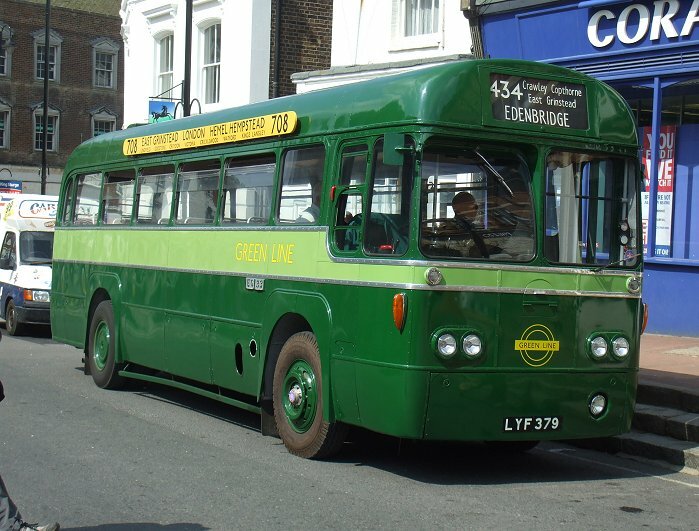 We turned right to Edenbridge Town Station. An Uckfield train was just departing as we pulled up. 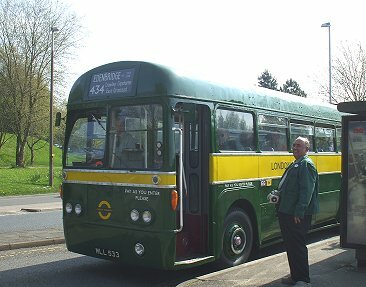 The bus turned in the sunshine for the photographers, then picked us up again for the journey onwards. 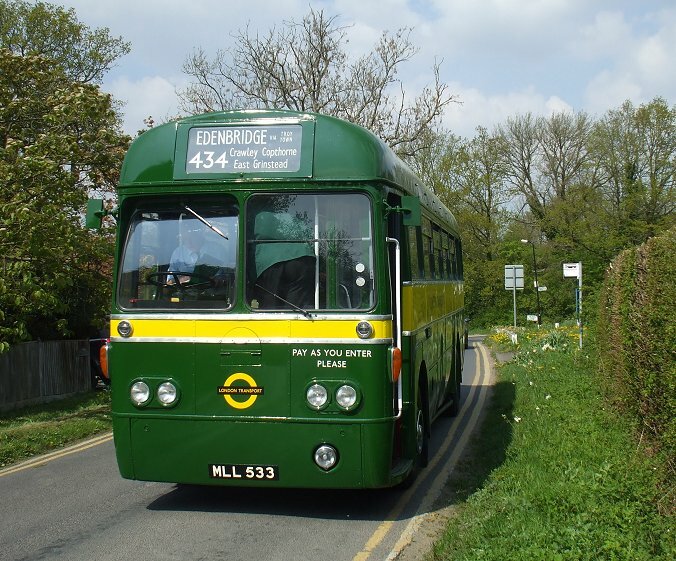 We headed north, up the hill under the low railway bridge at Edenbridge Station, and carefully located the turn-off at Hilders Lane, where we turned west. We rumbled out into the country to Troy Town Bridge, where we crossed over the railway lines and turned left. Another photo-stop, in the countryside this time. We went on, southwards down the narrow lane skirting the west of Edenbridge. The bluebells were in flower, carpetting the woods on our right. Our turn left, into Stangrove Road, was located, and we headed once more to Edenbridge Town Station. 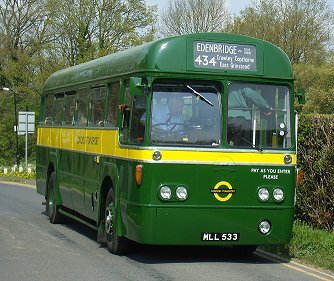 Then it was back towards East Grinstead: south through Edenbridge, then hard right to Marsh Green for the climb up over the county boundary to Dormansland. 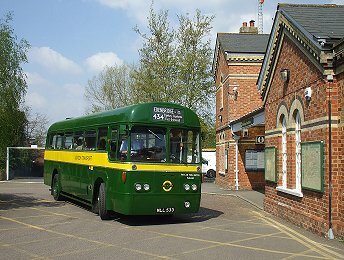 We paused at The Plough, for pictures as well as passengers. 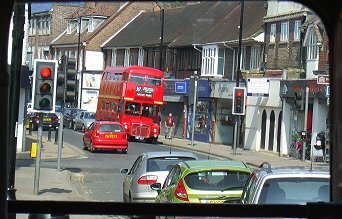 Then it was on to East Grinstead - up, down a little, up rather more to this town perched on the top of the Weald. 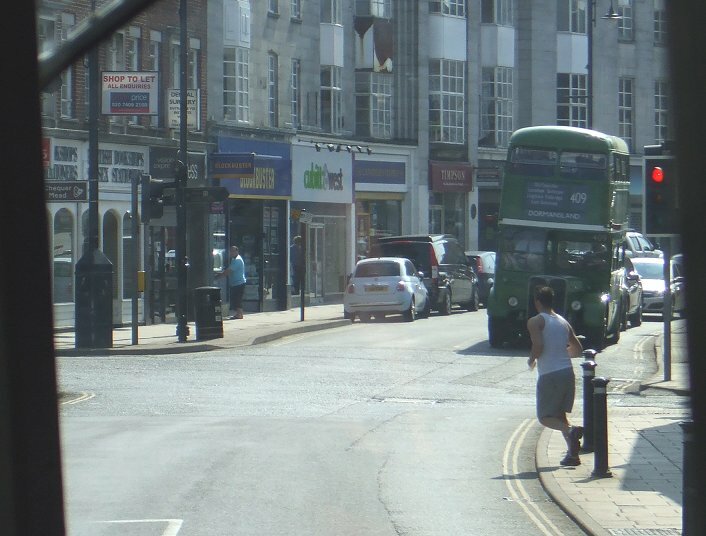 I alighted in the High Street (yes, at the very top of the town). 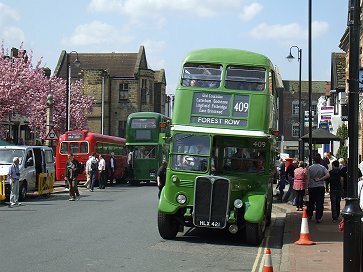 RT604 was heading back on the 409, heading to Forest Row, down to the south-east. 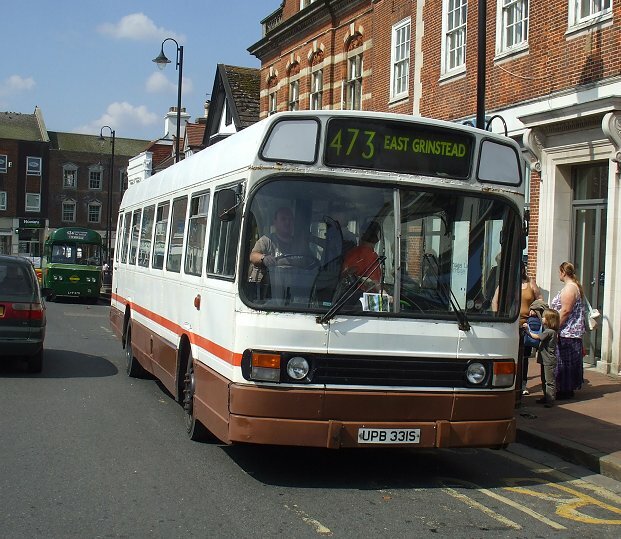 SNB331 was back from Crawley too, on the 473. Another pair of modernised RFs were there too, although both were in GreenLine livery, with a green cummerbund: RF168 and RF28. I walked down to the departure stop. 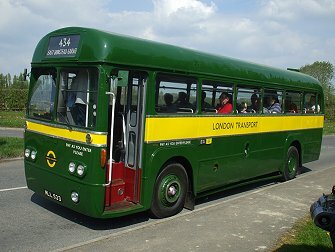 RM1397 rolled, working on the 409 I believe, although it was hard to tell. RF315 was standing across the street, with blinds for the 87.